It’s simple, really. There are two books – let’s call them two stories – under one cover. Here’s why. I worked on “The Reporter and the Ferret” off and on over a period of three or four years. I started, stopped, gave up, picked it up again, loved it, hated it and so on. I then published it online where maybe a dozen or so people read it. However, a few years later, I decided to forge ahead and wrote “The Reporter and the Hurricane.” This time, I went with Amazon and CreateSpace in order to have both an e-book and a paperback available through a reputable retailer. Since “Ferret” had been out there a while – way, way out there – I thought it fair to wrap both stories into one book. Here’s a glance at each. A 68-year-old woman with health problems who dies quietly in her home wouldn’t normally raise too many questions around town, even when she’s the sole heir to one of Oldport’s most successful entrepreneurs. However, when her orphaned pet ferret provides clues to JP Weiscarver, a young reporter always on the lookout for something suspicious, questions arise and old secrets come to light. Who would kill a woman and try to disguise it as natural causes? Turns out, there are a few good candidates. JP and his new pet work to “ferret” out the killer. Hurricane Clarice captures the public’s attention well out in the Atlantic Ocean, building to a super hurricane during a steady, straight shot at Oldport. Hurricane plans go into effect, even at the nearly completed towering jewel of a condominium right on the ocean’s edge. Whether it’s a woman of meager means seeking refuge in a shelter or an unscrupulous developer fleeing to remote safety, all must face the cyclone in some way. From heroes to villains, the local newspaper staff keeps up with the storm and hopes to not become part of the story. I had a little trouble finding the time to get into this book, but once I did, I couldn’t put it down. It was very well written and had a comedic relief along with a good storyline. It centers around a reporter’s life and problems as well as historical events. I highly recommend it. I can’t wait for Steve’s next book. Steve Martaindale’s two “Reporter” books are so fun to read. I recommend them both. As a former newspaper reporter / editor, I found myself missing the newsroom and former colleagues as I read these two short novels by Steve Martaindale. His characters are so true to life that I kept subconsciously changing some of their names in my mind to people I once worked with. Steve keeps the plot moving quickly in both of these stories, the first a murder mystery and the second a portrait of small-town politics. Both were engaging and kept me involved in the plot to the very end. The only disappointment I had was that they were over too soon. Fortunately, I know Steve is already at work on the next installment in the series. Can’t wait! Thoroughly enjoyable! Martaindales pen flows as personalities and scenarios come to life. He captures a newsroom, a reporter (and of course a ferret!) with such intrigue, excitement and clarity! Thank you Steve!! I enjoyed reading this book very much and am looking forward to the next one! I like the interplay with the ferret…it reminds me of my cats and some of our experiences. I chose this rating because I live on the gulf coast and we have hurricanes and this book was engaging. The characters were developed well and I felt like I knew them. I’m glad I read this. A nice first story for a new writer. The first mystery has a neat little twist at the end. I enjoyed reading it. I have known Steve since high school and could not wait to read this book. I was not disappointed. Stories are interesting, engaging, and fun to read. You’ll like Martaindale’s reporter, JP, and the characters in this true-to-life town! Great dialogue and characters! Martaindale spins a lovely story with a few surprises at the end! Two novels for one low price–worth it? You betcha! This new novelist, former journalist, turns his newspaper experience into a unique reading experience for all who give his books a look. 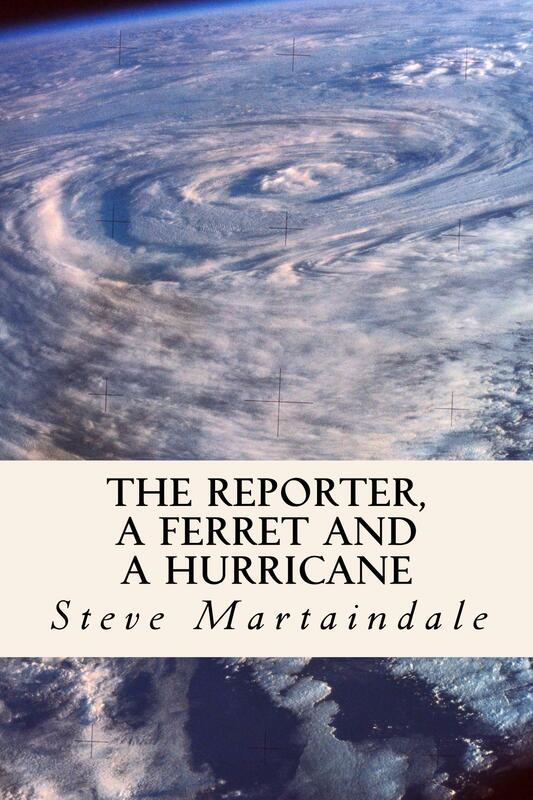 Steve Martaindale’s first story, A REPORTER AND A FERRET, is a cozy mystery with a masculine Texas flavor. Newspaperman, J. P. Weiscarver, is entirely different from, although equally as interesting as, Agatha Christie’s cozy Belgian, Hercule Poirot. Weiscarver takes a much more active role in the mystery-solving, though, along with newly-acquired partner, Bubba, the ferret. Martaindale’s small-town Gulf Coast Texans may seem as eccentric to some readers as the Belgian, but as a native Texan, I found it fun to read about people much like those I’ve been acquainted with all my life. Steve Martaindale took me where I’d never been before: inside a newspaper office. It was as if his character, Weiscarver, wore a hidden camera and mic so I could see the story behind the story feeding the front pages with news of the mysterious murder of a wealthy recluse. Martaindale’s deft interweaving of relationships made it nigh impossible to solve the crime–“nigh” because he gave just enough information to solve the riddle a second or two before the revelation, not a moment sooner–exactly as a good mystery writer should! The second novel, being offered in this deal, is A REPORTER AND A HURRICANE, a suspenseful natural disaster story with a Texas spin. This novel keeps most of the first novel’s cast of characters–Weiscarver, in particular–and adds new ones. Once again, Martaindale took me where I’ve never been before: inside a hurricane. With his newsroom experience, he gives the reader a play-by-play account of what happens as people prepare for a Gulf Coast hurricane, experience the brunt of it, and live to describe the aftermath. Better than a weather report, it’s a human interest drama, and not all the characters live to tell about it. Who will survive? What will happen to the glass skyscraper, possibly not built to safety standards, when the ruthless owner seeks publicity by suggesting it be used as a shelter? I personally found the story better in the first novel and the writing better in the second, but I thoroughly enjoyed both. In both, I met people, major and minor characters, whose winsome personalities made me want to meet up with them again, even now, months after finishing their stories. Good news: Weiscarver has more adventures coming soon—in Antarctica of all places! Yet again, Steve Martaindale boldly takes his reader where he has never gone before!